Born in Glukhovka (Gomel reg. Belorussia) 1906. 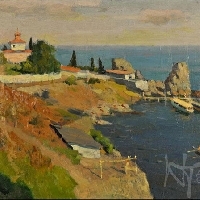 Studied at Odessa Polytekhnikum of Visual Arts/Art Institute 1925-31. Member of the USSR UNion of Artists. Active in Odessa, Ukraine. Important shows include "All-Union Art Exhibition", Moscow, 1947; "All-Union Art Exhibition", Moscow, 1950. Specialised in landscapes. Merited Artist of the Ukrainian SSR. Died 1984.